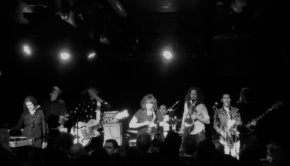 Knifeworld are a band that leapt out of the shadows fully formed and blew me away at the Summer’s End Festival in 2012. Like many others who there that day the band were a revelation and one of the highlights of the weekend, the exuberant 8-piece line-up including bassoon, saxophones and choral vocals alongside the usual rock band instrumentation. Originally intended as a solo project for Cardiacs man Kavus Torabi, debut album Buried Alone: Tales of Crushing Defeat was released in 2009. A fine piece of work, it laid out the basic structures of the Knifeworld sound which, through the intervening years and plenty of live work, have now evolved into a proper band. I have been looking forward to follow-up The Unravelling for ages and I am pleased to report that it doesn’t disappoint in any way. Featuring the full octet band it sounds like no one else, taking the components forged in the fires of the debut album and revealing them anew in an album of twists, turns and unexpected delights. Kavus Torabi has an uncanny knack of taking all manner of disparate musical parts and melding them together to form something uniquely new. The players do their thing in an abandoned and glorious way that I’m sure will translate these new songs to the stage beautifully in the forthcoming run of shows to support the album’s release. This is a wonderfully crafted piece of work packed with melodies, fun and quirkiness in abundance. Clearly a lot of time, effort and care has gone into making The Unravelling and the attention to detail is noteworthy. Most of the songs lie within the 5 to 9 minute zone which suits Knifeworld’s music nicely as it gives space for the ideas to breathe whilst not getting bogged down in repetition. Knifeworld are a more psychedelic prospect than Cardiacs – Tim Smith preferred that term to describe his music – as in Kavus’ hands it fully comes into play, some of the punkier elements smoothed off whilst retaining the dextrous joie de vivre and freewheeling charm. The songs are fascinating with lyrics that draw the listener in whilst being open to alternative meanings so I took the opportunity to ask Kavus if he could provide a sentence or two for each song to help understand some of the thoughts behind them. He agreed so it makes sense to go with a track-by-track approach with an introduction to each by Kavus himself. And that is just what it does. I love the way this song opens, the haunting introductory vocal from Mel Woods in a restrained setting supported by a fascinatingly edgy backdrop of weird sounds and bursts of grinding guitar. It gives a sense of foreboding before the song bursts open and explodes all over the place with powerful drums and strident guitar riffs perfectly matched by near operatic vocals, the whole being immediately striking and completely awesome. The intro makes this song in my opinion, the juxtaposition working a treat, and it is lovely to know that after such a long time kicking around in Kavus’ brain it has finally found a home – and such a compelling one too. This track has a fine groove, power and a psychedelic edge, the melody is great and there is lots going on throughout utilising the full expansiveness of the line-up. It’s a confident opener that immediately whets the appetite for the rest of The Unravelling, covering a lot of ground from stadium sized rocking to chamber quartet mellowness all rounded off with a great chorus. Short and quite brutal at times, this is a high energy and upbeat thrash through the left-field of Kavus’ imagination with the bassoon/sax combination and vocal harmonies opening out the sound whilst Kavus throws in a marvellously to the point solo. At the end it hits you how much they’ve managed to pack into a minute and a half – incredible – and it’s the conciseness of the writing that makes it all work. This isn’t chin stroking muso noodling, it’s focused, fun, funky, gritty and inherently interesting which makes it a good bet for long-term enjoyment. The great introductory melody puts Chloe Herington’s bassoon to the fore amidst a Cardiacs influence inherent in the jumpy rhythm, the seafaring images of the lyrics coming to life as the track rolls with the musical waves. Kavus’ vocal delivery, ably supported by the collective ensemble, works fantastically well with bundles of personality and a cheeky glint in the eye as the track shifts through a number of changes. Emmett Elvin’s organ cuts through as the perfect foil for the woodwind and brass, changing to fast-paced and twinkling piano in the extended instrumental mid-section with all of the sectors of the band feeding off each other. Spine-tinglingly uplifting and ingenious, this has lots of the appeal of Cardiacs – who I sorely miss – but with Knifeworld’s unique additions and spin. Again the arrangement is startling and this is one of my favourites on an album of many fine tracks. The first taster release from The Unravelling, it opens with sax and wind driven fury before stepping back for Kavus to open up the song backed by electric piano as the story moves into an insistent chorus. The backing vocals work superbly but it is the monster riff that blows the track apart, briefly appearing to smack you across the face before hiding in the shadows again as the melody continues, finally revealing itself with full brass accompaniment. Mel takes the lead again, electric piano on one side, brass and bassoon on the other, drums keeping a steady pace. With Kavus interjecting it all becomes a kind of fugue before a full on metallic blast with soul-flavoured shrieks from guest Chantal Brown. Brilliantly realised and compulsive listening, I hear Cardiacs, Gentle Giant, metal, folk, jazz – the works. It flows beautifully from one element to the next and this must have taken an age to formulate but, man, was it worthwhile as it holds the attention and drive for the entire ride. An intriguing title for an equally intriguing piece, the story for which builds from sinister atmospherics, Kavus singing from out of a foggy landscape. The electric piano that emerges is pure Gentle Giant as the track builds – something sinister is hidden in the garden… The interjections of the wind section are superb, creating a dynamic landscape which, during the second half, adds dissonant squalls of brass until fading back into the fog. Gleeful riffing and big band arrangements, the second full song released from The Unravelling features a psychedelic jazziness, the power controlled yet released where necessary. All of the players’ contributions can be clearly heard and the definition is sublime, testament to a great mixing job by Bob Drake (an original member of Thinking Plague) that captures what this band is all about. There is so much going on that it could have become a soupy mess in lesser hands but here it sparkles and shines, each twinkle and chime picked out and clearly identifiable. This is a track with a definite flow and some lovely guitar from Kavus that builds to a burst of choral melody, uplifting and joyous. 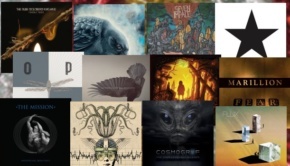 Prog heaven… but is it prog? Oh whatever, it’s just fantastic. Another change of pace with sinister, creaking horror movie keys conveying sparse otherworldliness and the kind of atmosphere you’d expect from the title. All of the sounds are chosen with care and deployed with thought, the melody that emerges is beautiful and this is a diversion on an album that has been particularly varied already, like a collage built around a chilling vignette. The finale and longest track is fantastic, emerging from a cyclical guitar figure, Kavus sets the scene as the rest of the ensemble join in. The big band feel emerges again in sporadic bursts, a beautiful addition that is consummately satisfying and underlines the skill in the arrangements. The piece builds and flows, everyone contributing in true ensemble style, the more acoustic nature of this track adding to the satisfaction contained within the album as a whole. An almost relaxing sway to round the album off in gorgeous fashion making it complete. To summarise then, this is an album I know I’ll be listening to for years to come. It has a compelling energy and enthusiasm, the music taking a wide-ranging cross-section of styles and influences resulting in a unique listening experience. The arrangements are superb as the various elements of the group buzz in and out of the mix, clearly identifiable and defined. 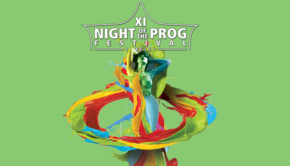 This is not just Prog with a capital P, it is progressive in the truest sense, crossing boundaries and not fitting solely within the genre. There is so much to offer here and, weird though much of it may sound to the uninitiated, given the right exposure I’m sure that it would no doubt find a much wider audience. Hopefully the recent signing to InsideOut and the release of The Unravelling is the first step of this process. Although championed by many prog fans the music transcends labels and is a Godsend to anyone with a liking for madcap and enthusiastic experimentalism packed to the gunwales with fantastic melodies and playing. There is so much more here than you’d get from any number of releases by most so-called progressive acts. Knifeworld is a band that has developed, stayed together and evolved and The Unravelling shows all of the parts bedded in and road tested with each member comfortable in their role. The results are 100% satisfying for anyone with a liking for a rollercoaster of ingenious melody and the unexpected set within a generally upbeat format. 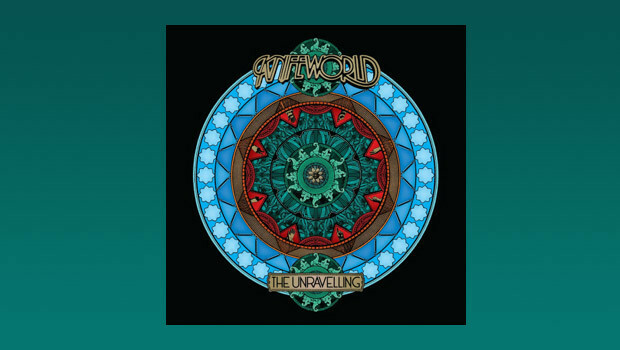 You can’t help but smile when listening to Knifeworld no matter how sinister and edgy they get. This is a very special band that deserves to be heard. There is thought, care, enthusiasm and above all talent in abundance. The results are shimmering in their intensity with all of the band’s facets beautifully displayed. A wonderful record and my favourite of 2014 so far, the competition will have to go some to beat it. If you get the chance to catch the full octet live don’t miss it, it’s quite an experience.